Uluru Camel Tours is Australia largest camel farm with more than 60 working camels. Your students will enjoy a fun and interactive experience with us. After a camel ride, students can wander through our saddlery where we hand-make our own saddles from scratch using original antique tools and methods. Learn from the “Australian Cameleers Exhibition’ a colourful and informative display of Central Australian history. 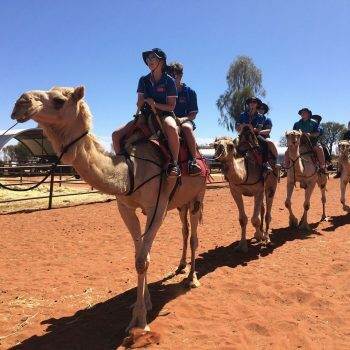 They’ll meet our outback Cameleers, hear their stories and learn the history behind some of Australia’s greatest and bravest explorers, pioneers, Afghan cameleers, ANZAC cameleers and Aborigines. We cater for children 10 -18 years old, large group sizes and we can customise excursions to align with the curriculum or your current classroom studies. Our farm has a fully equipped barbecue area and seating for up to 100 students, we invite you to use these facilities while touring with us. * School Groups Risk assessment available upon request.